It’s that time of year again, and some days it’s almost enough to make me log off social media for good. Sometimes it’s just not great for my soul. It’s just that not everyone is in that kind of place, financially or mentally or physically. Not everyone can have a getaway and experience God in powerful ways on a real or proverbial mountaintop, so it’s to those friends that I want to write today. 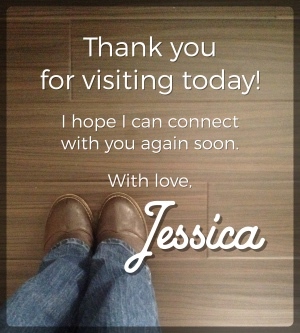 I myself sat down for my quiet time this morning and chuckled a little at what I saw. It wasn’t very picturesque, to say the least. It is summer, after all, and with my daughter home all day every day, there is a visible trail of destruction that follows her. My kitchen table is a no-man’s land of this week’s origami obsession, a fidget spinner and colored pencils thrown in for good measure. 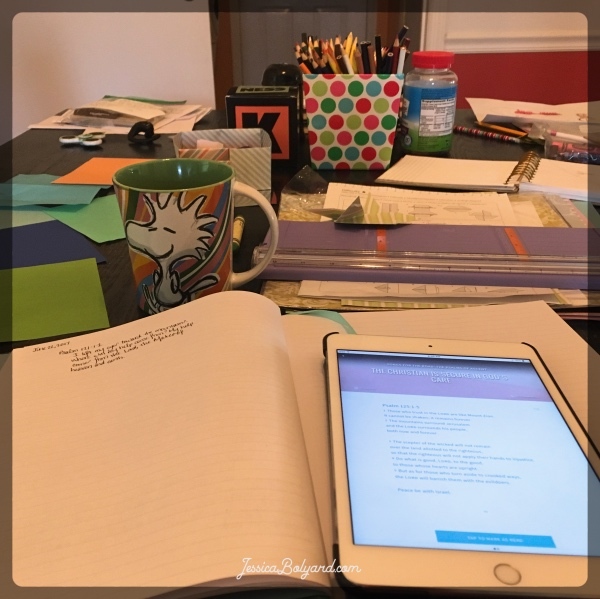 So when I made space (in my day and on my table) for a little time with Jesus this morning, I didn’t have a gorgeous view to post to Instagram. I had this. Somehow I suspect that maybe this is your scenery today, too. (And if you happen to be reading this from someplace beautiful, you’ll have to go home one day, too…and real life awaits.) I think my smeary kitchen counters and my overflowing laundry baskets and scattered library books are probably more the things of reality for most of us, but we don’t like to share that. There’s a whole other essay there for a whole other day, but I have another point for writing today. The thing is, I did find God in that mess this morning. He was there. Did I have a hard time tuning out the rustling coming from somewhere upstairs? Yeah. Did the dryer go off more than once, pleading with me to finally, for the love, finish yesterday’s laundry? Oh, yes. But was God here…or did He refuse to spend time with me until I cleaned up my act? He was here. Harder to hear? More difficult to sense? Sure. But He was here, right in the middle of my mess. So the reminder to you today? God moves in our messes, both visible and invisible…literal and figurative. Because you know what I’ve found? God has a real soft spot for messes. It’s all over Scripture – how Jesus seeks out the people whose lives aren’t perfect and who aren’t in a place they would want the world to see. He’s drawn to messes. He’s drawn to imperfect people and places. He reminded us that the healthy don’t need a doctor, but the sick. He came – He sought out – the ones who didn’t have it all together. The beautiful places are great for meeting with God. When I have traveled to Belize on mission trips, I am as excited about my quiet time in the tropical garden of our camp as I am about seeing the people I love. When I go on vacation, I love to find the most picturesque place I can (and yeah, I’ll probably post pictures). And at my house…well, I wish I had an isolated corner with a big, comfy chair with sunlight streaming through a picture window overlooking my perfectly-tended garden, but I don’t. I have an unkempt kitchen and artificial lighting. So what I really want to say to you today is this: the mess is okay. God can meet with you in the mess. He will meet with you in the mess. 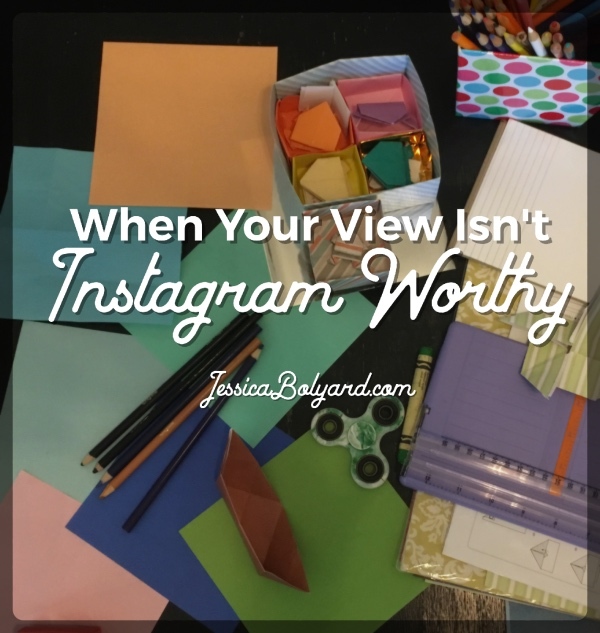 While it may be less distracting to be in a tidy, Instagram-worthy place, the truth is that life is not tidy and Instagram-worthy. Life has messes. God does not require our hearts to be cleaned up before we come to Him, and He does not hesitate at the doorway of a cluttered house before coming in and spending time with us. If we are able to push the mess aside for a little while – to disregard the cereal bowls and laundry baskets for a little while – God will meet us right there. He will step into our messes and equip us to handle them. He will come, and we will see Him. God really does have a special place in His heart for messes. He chose me, after all, and I’m a pretty big ol’ mess. He just doesn’t mind the mess nearly as much as I do. Yep – right in the middle of the mess. I have some picturesque corners but am ditching them this morning for a writing appointment next to an empty cereal bowl, crumb covered counter-tops and mounds of laundry. I hear the spirit speak back to me when I write words that flow from the deepest parts of my soul but haven’t made time for writing in recent weeks. 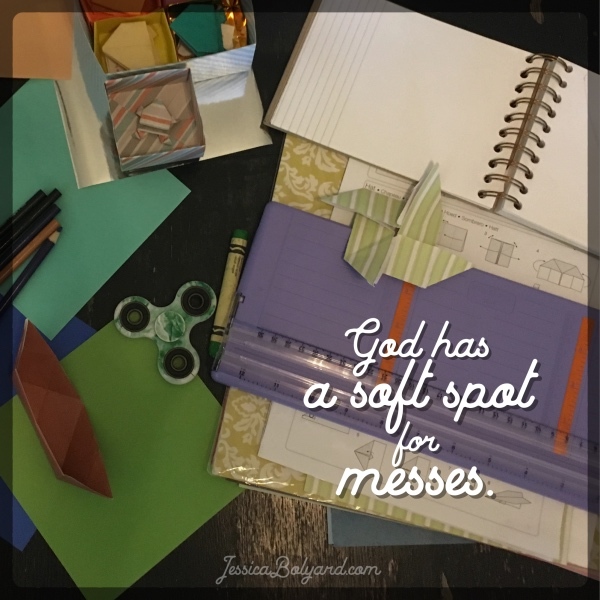 “God has a soft spot for messes” now that’s pinnable!!!! Great words this morning!